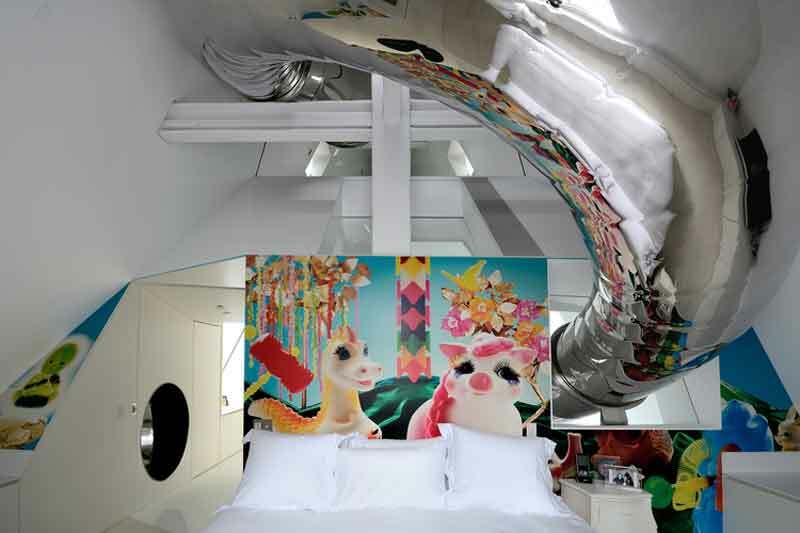 The SkyHouse Boasts a 50-Foot Climbing Wall & an 80-Foot Slide that Spirals Down Four Stories! If your kids have enough energy to literally climb the walls at home, the SkyHouse would be their dream abode. The Skyhouse is the perfect residence for those looking to capture the fun of the great outdoors right in the middle of their own home. Designed by architect David Hotson, the SkyHouse occupies the top four floors of a skyscraper in Lower Manhattan. It sports a 50-foot climbing wall in the living room, and an 80-foot metal slide that snakes its way from the attic to the ground floor! Why use the stairs when climbing holds and harnesses can get you around the house? A rock wall on the columns located in the living room reaches up into the underside of a third level terrace where it tapers at the end. A midpoint along the 50-foot wall features a balcony that allows for rest and a moment to enjoy the view of the skyline. A mirror-brushed, stainless steel tubular slide that emerges from a hole cut in the glass of the attic lets residents navigate the four floors of the abode. It features openings at sections to allow riders to make stops at different levels. Visitors are encouraged to bring along a yellow cashmere blanket to speed their trip to the bottom. The SkyHouse features ample natural light perfect for illuminating journeys up and down the columns. Vaulted ceilings and walls carve out the North Bedroom and Center Bedroom. The clean lines of the spaces and windows perfectly frame the spires of skyscrapers outside. White paint, glass, and metal work together to create a clean and modern aesthetic and allows accents of bright colors to explode like pieces of pop art. Both refined and fun, Hotson’s design combines very adult ideas of cutting edge architecture with the childlike energy of a playground. A 50-foot climbing wall lets visitors get a little exercise and check out the stunning views of the skyline outside. The slide snakes its way from the attic down to the bottom floor. Climbing holds help residents climb up to balconies and bedrooms. Harnesses keep climbers safe in the SkyHouse. The SkyHouse features an 80-foot stainless steel slide. Bedrooms and living spaces are accessible by climbing up, or stopping along several openings in the slide. Visitors are encouraged to use a cashmere blanket to hasten their trip to the bottom floor via the slide.